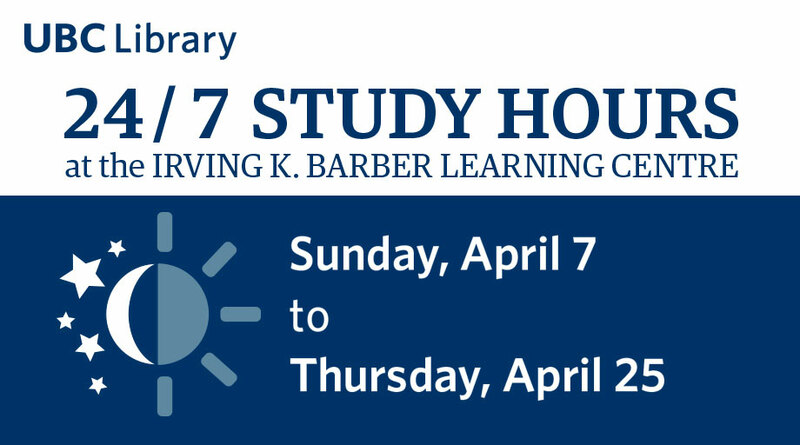 As we head into final exams, the Irving K. Barber Learning Centre will stay open longer to accommodate students and their study schedules. The Learning Centre will be open 24 hours a day from Sunday, April 7 (opening at 6 a.m.) to Thursday, April 25 (closing at 1 a.m.). Please note that this opening DOES NOT include: Level 1 (the lower level), the Chapman Learning Commons, Music, Art and Architecture Library or Ike’s Cafe. During the 24/7 opening period, regular cleaning of study spaces will continue. The computer workstations on Level 2 will remain open. If you are planning to stay overnight at UBC or have an early exam, check out the Commuter Student Hostel, where you can book accommodation online. Not sure where to go on campus? Travelling late at night? Afraid of going alone? Contact Safewalk, a free service that provides a co-ed team to take you anywhere you need to go on campus. Don’t walk alone – add Safewalk to your phone: 604-822-5355.